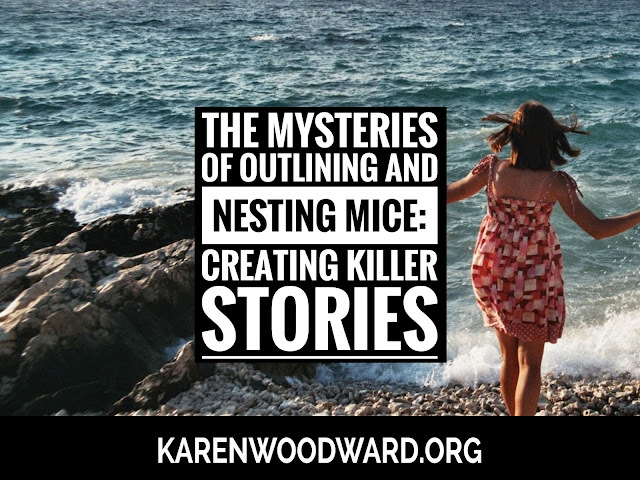 Yesterday I talked about Mary Robinette Kowal's workshop The Mysteries of Outlining and promised to show how this could be used in conjunction with Orson Scott Card's MICE Quotient to create killer stories. The power of structuring your story with MICE comes through when you start to nest story types. Let me give you an example. Let's say I'm writing a murder mystery. Usually murder mysteries are Idea Stories. They focus on the question: Who killed X and why? In an Idea Story the story is over when the problem--finding the murderer and explaining how the murder was done--is solved. But let's say I want to write my murder mystery as a Character Story rather than an Idea Story. I can do this. How? By nesting story types. In my main story I would focus on the widow and her changing role in society (a character structure) but since I want my story to also be a murder mystery I would have an Idea Story subplot where I ask the question: Who killed the widow's husband and why? When you nest story types it's crucial to close them out in the proper order. I would need to close out the Idea Story subplot first and only then, at the very end of the book, close out the Character Story by showing that the widow had found a new role in society (or, if I was writing a tragedy, that she failed to do so). If I had ended the story after the murderer was found and before the widow's fate was resolved my story would be incomplete and my readers dissatisfied. Each subplot of your novel can have a different story structure. Just because your main story is, say, an Idea Story, or--as with Lord of the Rings--a Milieu Story, doesn't mean that you can't have subplots that incorporate other story types. The question: How are we going to tell this story? Which action will be start with? Where will we draw the line between backstory, story, and postscript? In the wikipedia version of Rapunzel there is no backstory or postscript, all the events from 1 to 12 are included. So, again, how are we going to tell this story of Rapunzel? We can help decide this question by choosing a story structure. Let's try out each in turn. Let's say we want to tell Rapunzel's story as a Milieu Story. This means our story will begin when our main character, let's say that's Rapunzel, enters a strange new world and that the story will end when she leaves it. The only way that fits is if we begin the story at (3b) when Rapunzel enters the tower and end it at (8) when she leaves it. We wouldn't throw out points 1, 2 and 3a, they would simply become backstory and we would work them in at the appropriate time. It would be a sadder story, though, because we would leave Rapunzel learning to be free, learning to feed and clothe herself, learning to stay alive in the great wild forest. The prince's story could be a sub-plot, one we might decide to write as an Idea Story. In this case the question/problem would be: How can the prince free the princess from the tower? The story would end when the question is answered at (8). We would have to change the outline a bit so the prince's arc would end before the story ends at (8) so we would need to swap (8) and (9) in the outline. If we were telling this story from Rapunzel's point of view we might be most interested how she'll get away from the witch (question/problem: How will Rapunzel get out of the tower and escape the witch's power?) in which case we'd begin at (3a) with the witch taking the baby and putting her in the unscalable tower. The story would end when Rapunzel left the witch at (8). If we wanted to write Rapunzel as a Character Story how we began would depend on who we wanted to be our main character. If Rapunzel, we could start when she entered the tower as a baby (3b) or when the prince came into her life (6b), most likely the latter, since it's difficult for a baby to be unbearably dissatisfied with their life! The story would end when Rapunzel found her new role in life as queen at (12). If we wanted the prince to be our main character we'd start and end the story at roughly the same place, at (6b) and (12). The Event Story is about the world being out of whack and the main character has to restore order. For this kind of story it would seem easiest to take the prince as the main character. He's out hunting and he sees a beautiful maiden locked in a tower. Perhaps she doesn't call to him, perhaps he hides behind a tree and sees the witch climbing down Rapunzel's golden locks. He becomes outraged at the injustice of keeping a young maiden locked up in a dusty old tower and vows to set things right. To tell the story this way we'd have to change our outline slightly. Instead of Rapunzel seeing the prince and calling out to him, the prince would see the witch leave the tower and would go and investigate, so we'd need to change (6b). This story would end when the prince had restored order to the world and had taken Rapunzel home to be his wife and queen at (12). Alternatively we could have Rapunzel realize that being locked in a tower by a witch isn't normal. At the moment she realizes this, at the moment she realizes the woman she had thought of as her mother is actually her jailor, the story would begin--probably somewhere around the time Rapunzel has grown her hair (5). Everything before that would be worked in as backstory. The main story would end when Rapunzel's world was put right and she was part of a family (12). Instead of choosing a story structure and then figuring who we want our main character to be and where the story should begin, we could choose a main character and ask which MICE type would suit that point of view the best. Well, that's it for this section! Do you have any questions about Orson Scott Card's MICE Quotient and how to use it in an outline? If so, please ask! I was wondering, those of you participating in NaNoWriMo, how is your preparation coming along? Any tips or tricks you'd like to share?